If your business, warehouse or facility requires a roofing facelift, it’s important to find a licensed roofer who understands the unique requirements of commercial roofing. While residential and commercial roofs serve the same, protective purpose, their design and installation are different—and therefore require a different repair and construction approach. When installing a commercial roof, it’s important for your contractor to be flexible about working around scheduled business hours. Rather than disrupting clients or closing facilities during regular work periods, a qualified commercial roofing contractor may need to work off-hours or over weekends to complete the job. Commercial roofers must take building use into account when they’re installing your company’s roof— especially if your business contains heat-generating machinery, processing equipment or volatile chemicals. Reputable roofing contractors should carefully consider all aspects of your facility’s design before recommending a roofing material and installation process. For most commercial jobs, total roofing area is much larger than residential projects. Because of this, facility roofing should be industrial-strength, and should contain a heavy-duty underlay that will withstand weather extremes and regular inspection foot traffic. Make sure the roofer you select is well-versed in the installation of these heavy-duty materials—and that their crew is large enough to complete your project in a timely manner. Many large warehouses and commercial facilities are designed with flat roofs, rather than the slanted, gabled roofs common to Ontario residents. 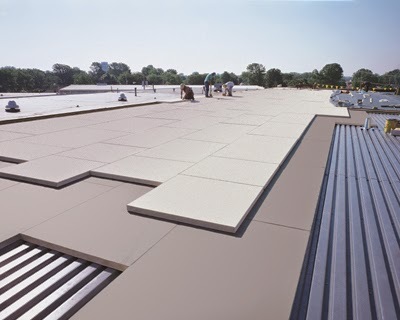 Talk with your roofing contractor about commercial roofing material options and their process for ensuring that your flat roof is strong and water-tight—since preventing leaks is critical to maintaining the integrity of your business equipment and product inventory. It’s likely that your company’s roof also contains many vents, drains and exposed pipelines, which commercial roofers have to work around (and seal properly) during roof installation. Before you settle on a commercial roofing contractor, take time to contact their references, check their licensing and conduct online research to ensure that you’re hiring a qualified, budget-friendly roofer with your best interests in mind. Labels: blog, business, commercial, contractor, hiring, roofer, roofing, social media.